Il Forno is a cozy cottage apartment sited where the old bakery used to be for the farmers and their workers - hence the name. It has been transformed into the loveliest 1-bedroom ground-floor apartment with views over our olive trees and the forests and vineyards beyond. You have your own out-door space that you can use for your al-fresco breakfast in the sun, and is still complete with its original oiled chestnut beams and terracotta tiles. There is an open plan kitchen, dining area and living space, and a small but functional bathroom with w/c, shower and basin. It also has its own antique terracotta wood-burning stove for those autumn evenings if it gets a bit chilly. 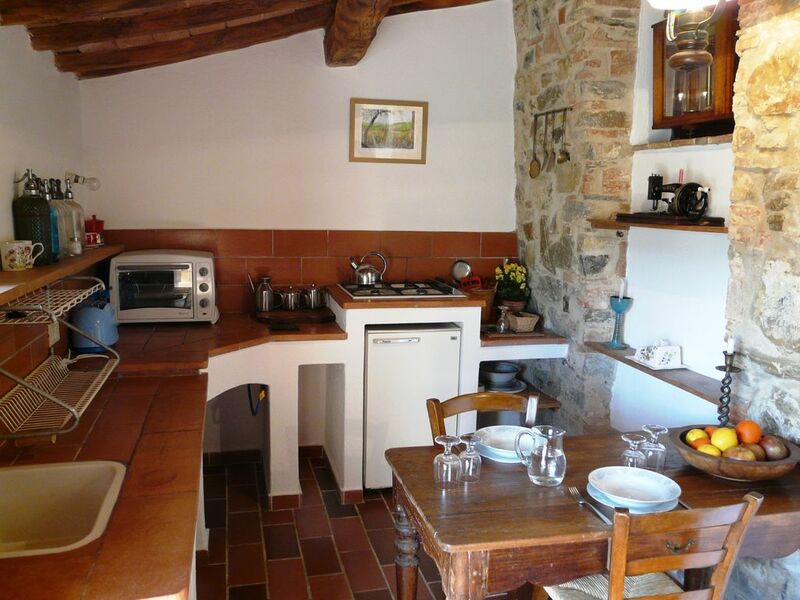 This apartment is very picture-postcard Tuscan, and is a favorite with our family and friends who come to stay. Podere Patrignone is a beautiful old 15th Century estate ('podere') which has been lovingly and tastefully restored. Patrignone is set on top of it's own hill reached by a long, winding private road that ends at Patrignone. It is set in 150 acres of forest, olives and vines, with uninterrupted 360 degree views over the Tuscan hills and valley below. It's the perfect setting for peaceful walks, sunbathing, cycling and exploring. It has a lovely pool with one of the best vistas in Tuscany. Wake up to the mists rising through the trees and the beautiful views of surrounding vineyards, or catch an amazing sunset over the towers of San Gimignano and the snow-capped Apennines on the horizon. toilet, shower, small but functional! We are 10 minutes away from San Donato, a similar distance from Castellina in Chianti, 40 minutes from the centre of Florence, 30 minutes from Siena, San Gimignano, Panzano, and Greve and around 90 minutes from Pisa Airport.